Intelligence is the foundation of foresight, so we need to offer some useful definitions for it now. 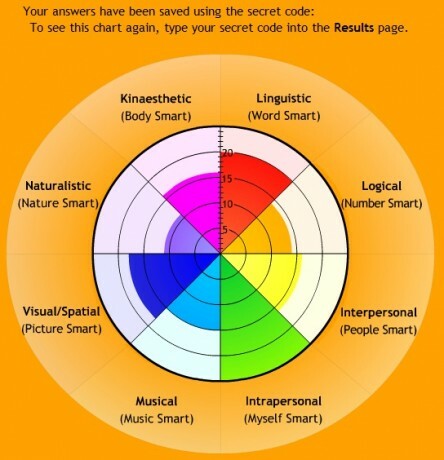 Cognitive neuroscience tells us our brains are significantly functionally specialized, and so we should ask what kinds or “modules” of intelligences would be in a minimum set that we should understand. In Chapters 7 and 11 (Acceleration and Evo Devo Foresight) we will propose an evo devo model of Five Goals of intelligent systems. We will argue that these seem to be particularly fundamental intelligence processes or types, as are the values we can derive from them, including a Ten Value model, which we can use as a way to understand adaptive leadership. For now, let’s stick to a more conventional view of intelligence, based on the literature of cognitive science. Again, we’ll see we can usefully view intelligence through a lens of five types. In his classic Frames of Mind, 1983 psychologist Howard Gardner proposed a model of (roughly) eight types of intelligence (picture right). It’s an appealing model that a number of primary schools have used to influence their curriculum, and there are some quick online tests, like this one at BGFL.org, that will help you self-rate on the various types. But as neither Gardner’s nor other multiple intelligence models have found much empirical evidence to support them to date, we won’t go in depth into his or other published models at this time. Instead, we’ll offer a simpler five factor intelligence model as a simpler initial model of the kinds of intelligence that matter in the modern world. Two particularly fundamental views of intelligence are IQ, also known as the g factor, a set of cognitive abilities that typically accounts for 40-50 percent of inter-individual performance differences on a range of different cognitive tests, and EQ, a range of measures of emotional self-awareness and control. As we’ll see, several studies have argued EQ is even more important than IQ in determining career success in many work environments. In this guide, we’ll assume System 1 is the same as our emotional intelligence (EI), and System 2 is our cognitive intelligence (CI), each crudely measurable by various imperfect tests, with scores commonly called EQ and IQ. 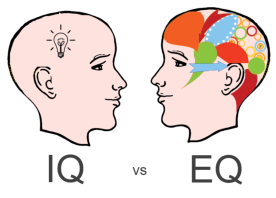 If you are low in either EQ or IQ, there are steps you can take to prevent that from hurting you, and if you are high in either, there are career opportunities you might explore. But the first step is to know yourself. As Kahneman did, we’ll treat EI and CI as our two most fundamental “internal” intelligences. From this base, we can then ask what additional, increasingly “external” intelligences have been added to these two systems as human civilization has developed around our biological bodies. We think that such a universal, evolutionary developmental perspective offers at least three other systems of “external intelligence” that we must be aware of. Keeping with Kahnemann’s approach, we will call these Systems 3, 4, and 5. System 3 is our social intelligence, the smartness of our community. Humans are unique in the animal world in our uniquely complex, always improving language, customs, ideas, and tools. We also have uniquely social brains. Part of our social complexity resides in us, and is moderated through linguistic and social functional areas in our brains, but the vast majority resides in all the ideas and information held outside of us, in other, different-thinking brains in our society. We didn’t invent our language and culture, they were absorbed by us, from the external world, as we developed. So in this sense, System 3 can be considered largely an “external” intelligence–it resides in all of the collective brains that interact with us, as well as our own brain. Daniel Goleman’s Social Intelligence, 2007, is a great introduction to using and improving this ancient and powerful system. Porter Gale’s Your Network is Your Net Worth, 2013, is a more pop overview of the power of your social network. Evidence-based books like Markova and McArthur’s Collaborative Intelligence, 2015, and Adam Grant’s Give and Take: Why Helping Others Drives Our Success, 2014, offer the research and the details on how and why working well with the right others, and being a giver, rather than a taker or a matcher (an even trader) will make you vastly more adaptive in the modern world. System 4 is our technological intelligence, the smartness in the tools and algorithms we’ve constructed since our own tool use began proliferating with a vengeance some two million years ago. We are increasingly using our brains and our societies to learn from and reshape our natural environment, in a process evolutionary scholars call niche construction. Like a spider’s web, a beaver’s dam, or a termite’s mound, we humans use our science and technology to build our local niche, which means we no longer live just in the wider environment, we live mostly inside our niche. Our cultural and technological niche is a microenvironment that has its own evolutionary and developmental pressures that are increasingly different from our macroenvironment. As we argue in Chapter 7, humans are the only species on Earth that has managed to start an accelerating process of idea and tool development and use. This system becomes an increasingly large percentage of our total intelligence every year forward, and will continue to do so for the rest of our lives. Some good books on the future of our technological intelligence are covered in Chapter 7 and Appendix 3. Brynjolfsson and McAffee’s The Second Machine Age, 2014 stands out as one of the better recent works. System 5 is our environmental intelligence, the smartness embedded in the universe and all the living systems around us, and the smartness of our understanding of living and universal systems, through science. This of course begins with our natural and universal environment, which itself has a deep internal physical and informational intelligence, evolved and developed over billions of years. Everyone should have to take a class on natural environmental systems in college. Those who did not would do well to read texts like Raven’s lovely Environment, 9th Ed, 2015. Books like Janine Benyus’s Biomimicry, 2002 explore how human designers are beginning to learn from nature’s intelligence, and books like Goleman’s Ecological Intelligence point the way to more sustainable consumption. For more speculative works on how our natural environment promotes and supports our biological intelligence, David Deutsch’s The Beginning of Infinity, 2012, James Gardner’s Biocosm, 2003, Stuart Kauffman’s Reinventing the Sacred, 2010, and the global and universal foresight sections of this Guide all offer helpful ideas. To understand human complexity, courses in biology, psychology, neuroscience, anthropology, sociology, behavioral economics, and evolutionary theory are all very helpful. Modern humans have to balance all five of these intelligences, and figure out which are most helpful for which contexts. For ourselves as individuals, working on Systems 1-3 (emotional, cognitive, and social intelligence) has traditionally provided the biggest payoffs. System 4 (technological intelligence) has long been critical in our daily jobs, but in the last few centuries, it has become our dominant social strategy for progress, as its relentless acceleration releases a plethora of new tools every year now that we can use to work on every social problem. Since the rise of environmentalism in the 1970s we are recently recognizing how important System 5 (environmental intelligence) is for health and renewal, at least with respect to our natural environment. We’ve become so successful that we’ve begun to degrade our global environment. Yet the universal dimensions of System 5, addressed in Chapters 7 and 11, still largely escape us. They are a journey that science still needs to make.